I love books that take fascinating research studies in the social sciences and share them as easy-to-understand stories. There is so much great research being done on how humans think and interact with one another that it only makes sense to try to look for lessons we can apply to our daily lives. What this month's recommendations have in common is similar to a previous 3BoT about creating change, except this time they all deal with the unconscious mind. All three authors make the argument that if you want to change something in your life, you have to start by becoming aware of things you normally don't think about. Then, when you better understand what's influencing you without your awareness, you can make adjustments so that the behavior you want comes more naturally. The number of factors that influence what you eat and how much of it you eat is much higher than you might imagine. 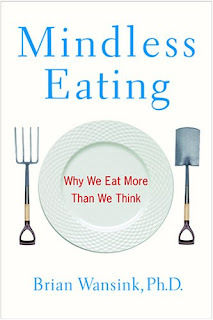 Wansink first introduces the concept of the "mindless margin": on either side of the point where you would exactly maintain your weight, there are a number of calories you can cut out or add without feeling starved or stuffed. This is why you can gain weight over time without feeling like you're overeating, and also how you can lose weight without feeling deprived. He then shares studies that have been done on every imaginable factor influencing what and how much we eat, from plate size to the number of food options to what you're doing and who you're with while eating. The idea? By changing your environment, you can start to eat less and/or healthier without having to consciously think about it. Vedantam systematically dismantles the idea that we only do things because we want to do them. 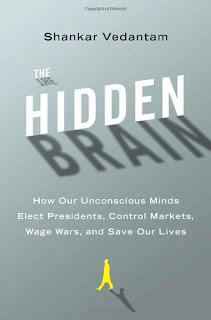 He illustrates through a large number of research studies and anecdotes how external forces we're not even aware of influence our behavior in a number of different ways. This book is perhaps most valuable in its invitation to empathy -- a better understanding of others who seem radically different from us but just have a different set of experiences and influences operating on them. But it is also a useful weapon against the problematic rationalizations we are all prone to. When we assume human beings always act rationally, then we may attribute our actions to conscious decisions we never actually made, and we may overlook the influences actually driving our behavior. 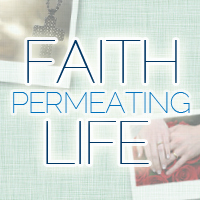 This book gave me a sense of relief (thinking, "Why in the world did I do that?" is normal and doesn't mean I'm careless or stupid) but also challenged me to look for deeper assumptions and biases underlying my behavior and work to change them where necessary. Why do habits form, and how can we consciously form new ones? These are the questions tackled by Duhigg in this book. Through various stories and studies, he outlines a framework for thinking about the creation of habits at an individual, organizational, and societal level. 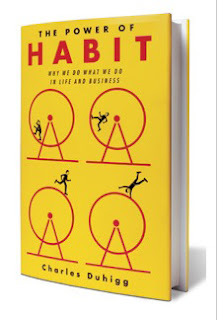 While the stories of individuals building new habits are interesting and even inspiring, perhaps the most valuable part of this book comes at the end, when Duhigg explains how to use the information in the book to create new habits in your own life, and uses a case study from his own life to show what that would look like. I do think that at times he shoehorns certain examples into his framework, and I still recommend other books more for creating change on an individual or larger level. But this book will get you thinking more consciously about your existing habits, from why you use toothpaste to brush your teeth to whether you're able to stick to an exercise routine. What other books have helped you understand the unconscious influences on your life and how to have them work in your favor?